100 grams organic, vegan friendly Clipper Instant Decaffeinated Coffee, made using fairly traded ingredients. The Clipper Organic Instant Decaffeinated Coffee - 100g product ethics are indicated below. To learn more about these product ethics and to see related products, follow the links below. Used daily, love the taste of a good coffee right down to the last granules. The best decaf i have had. Q: Hi can you tell me what process is used to decaffeinate this Cliper organic instant coffee. I am looking for an instant decaff that doesn't use chemicals to extract the caffeine. 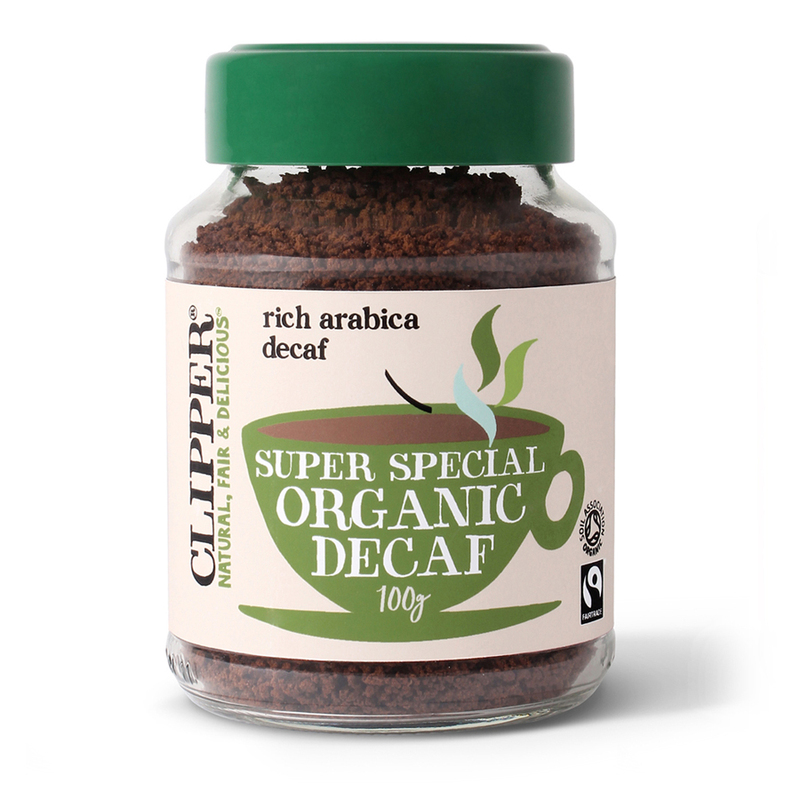 A: Clipper Organic Instant Decaffeinated Coffee is certified organic by the soil association. The Organic certification guarantees the decaffeination process employed is totally natural, ensuring there are no chemical residues in the product. You can be confident that the caffeine has NOT been extracted using solvents such as methylene chloride or ethyl acetate. The latter is better than the former from health and environmental aspects but neither method would be allowed for organic. There are two further processes. One is decaffeination using carbon filtration and the other uses liquid Carbon dioxide. As activated carbon and Carbon dioxide are both allowed as processing aids in organic production these processes may be used. The former is known as the Swiss water process and is the most common for organic coffee. 93 out of 112 found this question and answer helpful.